Sam and Ralph were over on the park swings, thrusting their legs back and forth as they swung to see who could swing the highest. Ralph was in the lead, and he squealed happily every time he hit the peak of his backwards swing, facing straight downwards to the mulch nearly six feet below. Only centripetal force kept him on the swing, but he was much too young to know about that. The three boys were all in Mrs. Wouter’s fourth grade class, but that wasn’t what had made them friends. They lived next door to each other, and their parents had been friends for years. Consequently, they were forced to spend time together as the parents did their adult things, and the kids eventually became friends. Well, for the most part. Sam and Henry were twins, but not identical. Sam had thin, blonde hair that fell down over the tops of his ears, while Henry had a shaggy brownish mat of hair on his head that he rarely combed. Their body structures were different as well: while Sam was skinny, Henry had a pudgy, ovalish shape that reminded others of an egg tottering back and forth as he waddled down the hallway sometimes. He was made fun of at school by some of the other kids, but he tried not to let it get to him. He had a few friends, after all, and they were nice. That’s all that mattered, he told himself. Henry wasn’t very sure Ralph was one of those friends. Sometimes he thought Ralph only let him tag along because Sam was his brother, but he never had the courage to ask Ralph to his face. Ralph, sporting red, spiky hair and a muscular body (about as muscular as a fourth grader could be), was one of the bigger bullies in their class. Nevertheless, Ralph seemed to go easy on Henry, if only because Sam was his brother, and Henry didn’t mind. “Bet I can fly farther than you!” Ralph yelled to Sam as they passed each other on their swings. Henry sat down on the still merry-go-round and watched. The last time he’d tried to jump from the swings he’d scraped his knee and almost lost his glasses, and he wasn’t in any hurry to try it again. In the back of his mind, he imagined Ralph suffering the same fate, rocking back and forth on the ground with a hand on his scraped knee. Both boys let go of their swings and flew out in an arc before landing on their feet on the mulch below. Ralph looked at Sam innocently and pleaded, “I was going to fall; I was just trying to keep my balance.” He took a baby step backwards, but it wasn’t enough to undo his cheating. Henry waddled to where the two other boys were standing still, determined to show that the skid marks where the mulch had been displaced didn’t actually mark where the two boys had landed. “It’s okay, Henry,” Sam said quietly. A burst of wind blew his blonde hair into his eyes and he shook his head to get it out of the way. The three boys shivered in the Fall afternoon and Henry zipped his yellow jacket up the rest of the way. Obviously wanting to change the subject, Ralph suggested they play hide and go seek. And with that, all three boys were running. Well, two were running, and the one in the back shouting complaints was more waddling than running. It was obvious who would be it and have to count, but Ralph looked surprised when Henry was the last to arrive at the metal spinning plaything. “You’re it!” Ralph mused triumphantly. With that he sat down and covered his eyes, shutting them tighter than needed, and pulled his jacket’s hood over his head. “One… two…” he started slowly. Suddenly, everything was spinning. Ralph started laughing as he ran off to hide. He’d spun the merry-go-round so Henry couldn’t figure out which way he went. That probably wasn’t his intention though; he probably just wanted to make Henry dizzy. It had gotten a lot colder outside since the three boys had arrived at the park almost an hour ago. Their parents were at home (Ralph’s dad says he checks on them every hour or two, but he doesn’t always). They trust their kids, and the fact that the park is less than a block away from their house (almost close enough to see, if it weren’t for the hills of their neighborhood and one house blocking the view) makes things seem a lot safer. And after all, it’s a very safe neighborhood to begin with. Although sometimes bad things happen in good neighborhoods, nothing had happened recently. The metal of the merry-go-round was cold against Henry’s bottom and he decided to stand up as he counted. The disk had stopped spinning, and his dizziness was passing. Off to his right, he could hear trees rustling. He smiled, thinking he had just gained the advantage over the hiders. He now knew which way they went, which would cut down search times significantly. A dog barked behind him, but it was far in the distance. Another gust of wind almost blew Henry off his feet. In response, his body shivered again, trying to raise his body temperature. He would suggest to the others that they all go home after this game. He’d blame it on the cold, and hope Ralph wouldn’t try to be a big tough guy and say he wasn’t cold. Henry opened his eyes and looked around. Everything was completely still. The wind had stopped and there were no animals around, no trees swaying, no cars driving on the nearby streets. Henry turned in a full circle to completely survey his surroundings, but made sure to remember which direction he’d heard the trees moving from earlier. There were four directions they could have gone. One way was across the street and out of the park, and he figured they probably wouldn’t have gone that way (Sam promised their parents they wouldn’t leave the park). To the left of that was someone’s house, which was possible. There was a big wall separating the park from the house that had plenty of dead shrubbery around it that would make some fine hiding spots. Behind him, there was another road and a tennis court: not a lot of hiding spots there. And in the last direction, there were tall trees and another big wall separating the park from another house. The last direction was the direction he’d heard the sounds come from when he was counting, so Henry started waddling that way. Normally, the big trees would have provided tons of shade from the sun, but the sun seemed to be playing hide and go seek as well; just badly. Clouds blotted out the sky, feebly trying to provide a hiding place for the sun. As Henry approached the trees, he listened harder for one of the boys to move and snap a twig and give away their position, but he heard nothing. The trees were skinny and branched out wide at the top, so they didn’t have a lot of branches near the bottom to climb up them with. Still, Henry gave a few furtive glances to the treetops. Dead plants littered the ground around the trees, and Henry crushed them into the packed earth as he waddled from potential hiding place to potential hiding place. As he leaned to look around a corner and past a large, dead log, a strong burst of wind appeared and almost knocked him off his feet again. He stumbled, but caught himself quickly, surprised at his own bout of agility. And just as the wind had started, it disappeared again. With it, however, all of nature’s sounds disappeared as well. The park was completely silent. I better find them quick, Henry thought. We should really be going home anyway. The trees behind the boy began to sway as if by wind, but Henry didn’t feel nor hear any. He spun on his heels to quickly look at the whole park again, half expecting some creepy monster to pounce at him from behind, but nothing was there. It was just the park that the three fourth grade friends always went to when they wanted to hang out. Just a little darker than normal, and also a little later than normal. Henry had had enough. He opened his mouth to shout to the other two boys, to tell them to come out of hiding so they could come home, that he gave up, that it was time to go home anyway. Except nothing came out of his mouth. He frowned, concerned, and tried again. Nothing. The silence of the park was overpowering, and it seemed his voicebox didn’t want to break the silence. Henry half-waddled and half-ran back to the merry-go-round: safe. He climbed on and sat down, desperately wishing Sam and Ralph would come back. Surely they would get tired of hiding eventually and come back. Right? The clouds in the sky grew denser, deepening their colors to a dark purplish-grey. The amount of sunlight visibly reduced as the sun moved completely behind a larger cloud, and suddenly it was very clearly night-time. Again, Henry tried to yell out his resignation and that they should all go home, but again his voice caught in his throat. In desperation, he banged the palm of his hand against the metal merry-go-round, but again the silence overpowered what noise should have been thre. The trees began to sway more violently. No, not sway. Shake. The tremor that shook the trees spread to the ground, shaking only the loose objects: rocks, twigs, the dead log. 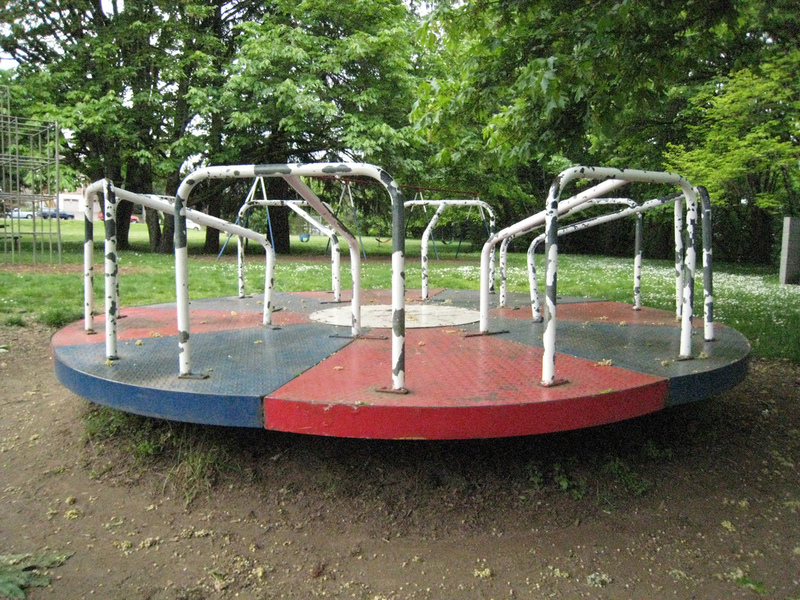 The ground itself, and Henry’s merry-go-round, remained stable. Terrified, he pulled his legs in and scooted back on the whirling play equipment, wrapping his arms around his legs and watching wide-eyed. It was too much. Henry felt himself scream and again the silence swallowed his voice. From the corner of his eye, he saw a shadowy figure approach from the trees to his right. Jerking his head, he saw Sam running furiously. Once or twice he looked back over his shoulder, but nothing seemed to be chasing him or be back in the trees. He tried to shout, “Over here! The merry-go-round is safe!” but couldn’t. Sam tried to talk to Henry when he got to the merry-go-round, but he too was unable to make any kind of noise. Frantically, he pointed to his throat with a look of distress and Henry knowingly nodded. Behind him, the shadows of the trees were growing longer across the ground, reaching out with shadows that looked like skeletal fingers, consuming the grass in a sea of darkness. The sky seemed to be getting physically lower also, adding a sense of claustrophobia to the park as the black clouds neared closer and closer to the ground. Henry grabbed onto of Sam’s arm, pulling him tight. His blonde hair had become disheveled and he was shaking in fear. The two brothers stood together on the merry-go-round, completely frozen in fright. A loud crack split through the air as the first sound in what felt like an eternity, and both boys jumped for each other as they jerked their heads to the source of the sound. A large tree limb fell from a free merely ten or twenty feet from the merry-go-round, landing with a resounding thud on the ground. The limb was completely black from rotting and much of the bark had been peeled away, revealing large holes that had tunneled through the mass of wood. Behind the fallen limb, Ralph emerged from the trees. He was staggering more than running, but he was still moving quickly towards the merry-go-round. His face was contorted in an eternal scream that produced silence, and his eyes were shut tight as if he were crying or in pain. Ralph stretched his arms out to the sky and stiffly froze in place, as if he were a gargoyle that had been carved in the shape of a boy. Henry opened his mouth to scream again, but found he still could not make his body do what he wanted. He began to silently cry in fear, worrying about what had happened to Ralph, but worrying more about what could happen to himself. He looked down at his hands and flexed his fingers, making sure they could still move, completely sure they were all turning into stone. Behind his hands, Henry watched the bones in Ralph’s legs melt into a black pus that oozed through his skin, and tried again to scream as he fell down to the ground in a position that nearly induced vomit. As Ralph hit the ground, a grey powder flew up from the ground, expanding outwards to engulf the boys in thick, grey smoke. Eventually, it cleared somewhat, but the wind had apparently wrapped it in place, swirling closely around the boys with very little room to breathe. Among it, small sticks and twigs were mixed in with mulch, flying quickly through the air, around and around. Henry pulled again at Sam’s arm, wishing to be somewhere else–anywhere else. Even if his legs were working, he couldn’t have left without his brother, who seemed to be just as frozen in fear as he was. Ralph’s body began smoking, and the opaque mist rose higher and higher in the air, mixing in with the dust and twigs to create a smokescreen that erased the rest of the park from the world, trapping the boys in a small column of darkness. Another frantic tug at Sam’s arm yielded the first noise in the night in a while: a slow (and wet) ripping sound as Sam’s arm detached from the rest of his body. It fell to the ground below, where it melted into a mass of writhing, black worms. They immediately began crawling towards Henry, but his shoes had begun melting into the merry-go-round and he was too frantic to think to take them off. Looking back up at Sam, darkness seemed to flow directly out of the new hole in Sam’s torso, slowly filling the close vicinity. Sam’s eyes had closed, and when he reopened them they were filled with the same blackness that had plagued Ralph when he stumbled out of the woods. The dust burned through Henry’s clothes and into his back, causing him to cry out (silently) in searing pain. The last thing he saw before his eyes exploded into nothing was his brother sinking downwards, becoming nothing but a puddle of the black goo seeping out of his skin. He tried to shout one last time, but if he had made a sound it was drowned out by another voice that seemed to come from everywhere at once.